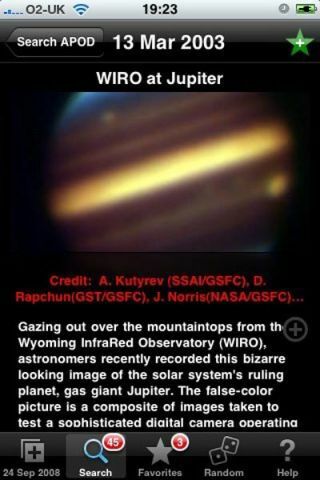 The iAPODViewer application for the Apple iPhone lets you put NASA's Astronomy Picture of the Day on your mobile screen, such as this Jupiter image. Boredof checking that stripped-down version of Facebook? Try space instead. NASAwill phone home daily views of the infinite cosmos, as long as you're sportinga shiny new Apple iPhone and a neat new software application. Eagerstar-gazers can download the iAPODViewer, developed by the London-basedsoftware company Send Me to Space, and receive pictures directly from NASA'sAstronomy Pictureof the Day Web site. A professional astronomer's description accompanieseach picture. "TheiAPOD application allows people to get a unique glimpse of our fascinatinguniverse directly on their mobile phone," said Michael Kaye, a leadiAPODViewer developer. iPhoneusers can take advantage of a keyword search function to uncover every Pictureof the Day ever published, as well as save their favoritepictures. Shaking the iPhone or iPod Touch produces a random image eachtime. Thesoftware is also compatible with iPhone Safari, but specifically designed fromthe streamlined interface of an iPhone, designers said. Thenew Apple app joins a growing number of astronomy-centered software fornetizens, including Microsoft's free online WorldWideTelescope which allows users to zip through a virtual night sky.